TICKETS (AUS) (Bay 2006-Stud 2011). 4 wins-2 at 2, STC Phar Lap S., Gr.2. Sire of 140 rnrs, 62 wnrs, inc. Eastender, Difficult to Get, Gracious Ryder, Happy Fiery Dragon, Ixcatan, Mr Conductor, Ticketing, Tickets on Her, Hand it In, Just Truckin', Salesman, Backstage Pass, Elle a Walking, Radiant Girl, Space Time, Tickets to Ride, Concessions, Lucky Ticket, Mr Tickets, That's the Ticket, Celtic Diamond, Dream in Colour, Free Ticket, etc. Tiaconi (f. by Nicconi). 4 wins to 1100m to 2016-17 in Aust. Kikimora (f. by Snippetson). 2 wins at 2 in Aust. A Rare Old Time (f. by General Nediym). 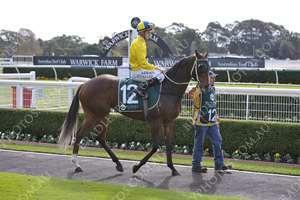 Winner at 1650m in Aust. Good Verdict (g. by Star Witness). Placed at 3 in 2016-17 in Aust. Palm Flyer. 4 wins-3 at 2-to 1200m, AJC All State Electrical Services 2YO H., Malaya 2YO H., Singapore TC Benchmark 75 H., 2d AJC Ma Cherie 2YO H., Singapore TC Benchmark 74 H., 3d AJC Fairfield Advance Newspaper 2YO P., Singapore TC Class 3 H., Benchmark 75 H.
Showmanship. 2 wins at 1600m, MVRC Super Vobis 3YO H., 2d MVRC 150th Night Race H., 3d VATC Sharp Corporation P.
Kudero (Choisir). 12 wins-1 at 2-to 1200m, A$520,740, to 2016-17, ATC Cancer Foundation H., Theraces Sprint H., Ibis Milano Restaurant H., BRC Brc.com.au H., Lilivale Endless Maize H., Illawarra TC AJ Illye Memorial H., SCTC XXXX H., 2d ATC June S., L, BRC Bluescope H., ATC Byron Thomas Recruitment H., Lest We Forget H., 3d ATC Ibis Milano Restaurant H., BRC PFD Foods H., 4th ATC Star Kingdom H., Gr.3. Malambo (Choisir). 5 wins to 1300m, A$249,965, AJC Randwick Betting Auditorium H., STC Jacob's Creek Sparkling H., 2d STC Darby Munro H., L, AJC Super Impose H., ATC Centennial Park H., St Johns Park H., STC Theslipper.com.au H., Eeaa Best Venue Team 2008 H., Golden Slipper Festival H., 3d Wyong RC Magic Millions S., AJC Australia Day at Warwick Farm H., Randwick Betting Auditorium H., ATC Happy 35th Birthday Mario Tartak H., Wyong Rugby League Club H., STC Rosehill Event Centre H., TAB Number 1 Club H.
Miss Independent. 3 wins-1 at 2-at 1200m, A$551,155, AJC Inglis 2YO Classic, Research H., STC Inglis BC3 Future Stars Sale H., 2d AJC Gold Edition H., Wilson Asset Management H., Fairfield H., ATC TAB Sportsbet Iphone App H., CC's You Can't Say No H., STC Keno H., Canterbury Event Centre H., Pages Event Equipment H., 3d AJC Catalan Opening H., Paul Curran H., 4th BRC Nudgee H., L. Producer. GOOD STANDING (Artie Schiller). 3 wins-1 at 2-from 1200m to 2000m, A$681,450, to 2016-17, ATC Skyline S., Gr.2, MRC Caulfield Classic, Gr.3, BRC Queensland Day P., L, 2d ATC Jimmy Cassidy Golden Gift 2YO P., 3d ATC Stan Fox S., Gr.2. TEMPT ME NOT (Strategic Maneuver). 3 wins-1 at 2-to 1200m, A$271,140, ATC PJ Bell S., Gr.3, TAB Place Multi H., 2d VRC Gucci S., Gr.3, ATC Victory Vein 2YO P., Tradie Magazine H., 3d ATC Light Fingers S., Gr.2. PALM BEACH BABE (Squill). 3 wins. See above. Northpace (Cape North). 4 wins from 1300m to 2000m, A$120,020, to 2016-17, WATC Dayana P., Facebook.com Racingradiowa H., 3d WATC Belmont Guineas, L, Belmont Classic, L.
PLANET VOYAGE (Exceed and Excel). 7 wins-2 at 2-to 1200m, A$400,371, SAJC Manihi Classic, L, Alice Springs TC Pioneer Sprint H., 2d MRC Vain S., L, 3d MRC Debutant S., L.
Dance With Deb (Desert King). 2 wins at 1200m, City Tatt's RC Glenmore Meat Company H., STC Solo Sprint H., 3d STC Eskimo Prince H., L.
ATTENTION (Stratum). 2 wins at 2, A$373,000, BRC Sires' Produce S., Gr.2, ATC Schweppervescence H., Gr.3, 2d BRC Champagne Classic, Gr.2, MRC Autumn S., Gr.2, ATC International Animal Health 2YO P., 4th MRC Futurity S., Gr.1, Gold Coast Guineas, Gr.3. Choisism - Happy Everyday (Mal.) (Choisir). 4 wins to 1200m, Singapore TC Class 3 H., 2d MRC All Shot H., Singapore TC Panasonic Toughbook S., 3d VRC Maribyrnong Trial S., L.
Race Record: 4 Starts 0-0-0 A$5,500.